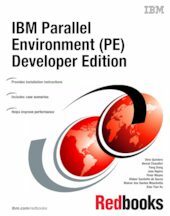 This IBM Redbooks® publication addresses topics to take advantage of the strengths of IBM PE Developers Edition for HPC applications. The objective is to solve customer's challenges and maximize systems' throughput, performance, and management. This publication examines the tools, utilities, documentation, and other resources available to help the IBM technical teams provide solutions and support for IBM HPC solutions in an IBM hardware environment. This IBM Redbooks is targeted toward technical professionals (consultants, technical support staff, IT Architects, and IT Specialists) responsible for providing HPC solutions and support.